For tickets, contact Bruce Burchsted: (203) 235-6334, or the Church office: (203) 235-5704. 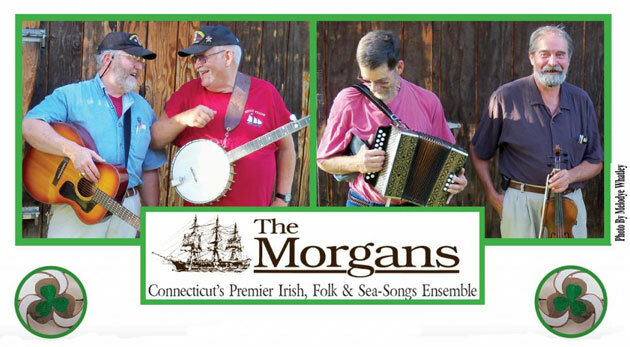 “ A Patriotic/Celtic Christmas ” • On Friday, Dec. 7th, 2012– the 71 st anniversary of Pearl Harbor Day, THE MORGANS will present a mixed evening of patriotic and Celtic songs of the season at the 1 st Congregational Church, 62 Colony St., Meriden, CT. 7:30-10 P.M.
Cabaret style seating with light refreshments and beverages provided (folks are welcome to also bring their own refreshments and beverages – no alcohol please). It's a great way to start the Christmas season and salute our country by honoring those who have served in our military. Tickets are $15. in advance, or $20. at the door. Call the Church office: (203) 235-5704 or Bruce Burchsted: 203-238-7784. MIDDLETOWN -- After sticking together for the better part of three decades, members of the folk band, The Morgans, have learned to laugh at their longevity. "We’ve been around so long, we were on a first name basis with Adam," joked band member Tom Callinan to the audience attending a special concert in the auditorium of the Middletown High School. "In case you’re wondering folks, we do have some of our old Edison cylinder records still available for sale." While The Morgans have changed some members since their formation in 1971, the current core group of members has been in place for several years. The band has been booked as the opening act for such groups as the Irish Rovers and the Clancy Brothers with Robbie O’Connell, and is also widely regarded as one of the premiere local bands specializing in traditional folk songs, sea-sings and chanteys, and folk-revival songs. The band has also written and recorded a number of contemporary environmental songs to help save the whales and the earth. "We really perform a wide range of songs," noted band member Tony Morris. "All of us are also able to play several different instruments during our performances." This diversification of musical talents was on full display at Sunday’s concert, as band members routinely switched instruments, often during the middle of a song. The eclectic mix of instruments included guitars, harmonicas, violins, fiddles, spoons, banjos and the accordion -- just to name a few. The concert was meant to be a showcase for all things Irish, as a means to celebrate the upcoming St. Patrick’s Day. The Morgans masterfully played Irish favorites like ‘When Irish Eyes Are Smiling’, ‘Marry Mary Mack’ and ‘The Sky Boat Song,’ and at many times had many in the packed crowd singling along and stamping their feet. Band member Don Sineti, a founding member who has been with the band for 32 years, took time to give a brief history lesson on the Irish and their role in helping to build the infrastructure of the United States. "The Irish worked on America’s railways, they dug the canals, and they worked in the coal mines. And often, they would sing the sea shanties they brought from Ireland while they worked, often when they weren’t even working on the sea," said Sineti. The band then broke into a rousing rendition of the sea shanty ‘Patty Works on the Railway,’ which had many in the audience singing along to the lines "fiddle me, ora-ora-aay, fiddle me ora-ora-ay." After the concert, members of the band conceded that the band did not have deep Irish roots, and only a few of the band’s six members were part Irish. But from the sound of things during the concert, you would have thought you were listening to a band of musicians straight from the streets of Belfast or Dublin. Chris Morgan, another founding member, noted that a number of Celtic and traditional Irish instruments were used during Sunday’s concert, including the Bodhron (a hand-held drum), the Irish bagpipes, the Limberjack and the fife. "You might see some type of jam session like the one here today over in Ireland. Just a group of musicians gathering on the streets or in a pub to play music. That is what we hoped to accomplish here today," said Morgan. Morgan said there are common themes in most Irish folk music -- like being separated from a loved one while at sea, or strong feelings of patriotism -- which usually evict a strong emotional reaction to the crowd. That was evident during the band’s last number on Sunday. When Callinan asked the audience what song they would like to hear to close out the set, several people shouted out without hesitation "Danny Boy! !, Danny Boy!!." The favorite might be the most well-known and well-covered Irish folk ballad, but the band really made the number their own. The sound of the Irish pipes, the strings of a violin, a guitar and a wind flute mixed together into a sound as crisp and clear as the winds over the Emerald Isle itself, which moved many in the audience to tears. "All six of us don’t always get to play together, so it was wonderful to be able to come here today and be able to play such fabulous Irish music in front of such a warm crowd," noted Callinan. Callinan, in fact, is no stranger to Middletown High School. He was born and raised in Middletown, and graduated from Middletown High before joining The Morgans. Back in 1991, Callinan became Connecticut’s first "official state troubadour," and has since gone on to became a successful folk singer, storyteller, multi-instrumentalist, sea chantey-man and environmentalist. But it was apparent that Callinan was enjoying being back in his old stomping grounds on Sunday. While answering questions during a break, Callinan was approached by a man he used to deliver newspapers to when he was a child, and was also greeted by several people he went school with. "It’s always good to come home," he said with a smile. The Morgans aren't just a novelty band. The group has been entertaining audiences with Irish folk music and sea-inspired songs since Chris Morgan and Don Sineti founded the band as a duo in 1971. CLINTON -- Classical music aficionados know the "William Tell Overture" as a wonderful composition by Gioacchino Rossini. Fans of pop culture know the song as the theme from the "Lone Ranger" and may remember a novelty version of the song performed by Spike Jones in the late 1940s. The patrons of Mad Murphy's Pub in Hartford know of a different version of the song, performed by The Morgans, who interpreted the song with banjo, guitar, penny whistle, accordion and fiddle. Now music lovers of all ages can experience The Morgans' version of this song, as it joins newer compositions on "Hove Down ...& Out," the group's seventh album and first new recording in over a decade. The Morgans isn't merely a novelty band. The group has been Sunday nights. entertaining audiences with Irish folk music and sea inspired songs since Chris Morgan and Don Sineti founded the band as a duo in 1971. In 1973, the group expanded to include Tom Callinan, and from there the reputation grew. The band gradually expanded to include as many as six players. While many musicians gravitate to the latest trends, for the Morgans, Irish music was second nature. "Being Irish helped," explains Callinan, who aside from being a musician in his own right, has served as the group's business manager since 1977. "My dad was a singer and I was surrounded with music all my life." Callinan had left the Marine Corps in 1971 and went to Central Connecticut State University in New Britain to finish his bachelor's degree in English with a concentration in music. While taking a course in Irish literature, he was told about a duet performing in Hartford on Sunday nights. "During the break, I went up to speak to them," Callinan stated. "They were milling about the crowd. I met Don first and I had just gotten back from Ireland." 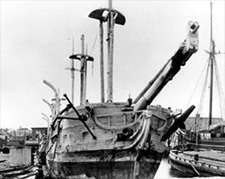 The duo asked Callinan to sit in with them for about six months before he joined the group officially with its first album, "Go To Sea Once More." In 1985, the group released "Soundings For The Whale," a commemorative album celebrating the 10th anniversary of the Spring Whale being designated Connecticut's state animal. The group had been involved in the save the whale movement since the early seventies. The album was joined by a multimedia concert in which the group played to [a] slide show presentation with images dissolving into one another from three projectors. "You couldn't watch it while you were playing," Callinan remembers. "During a rehearsal, we were singing and trying to watch what was happening at the same time that we were singing. We forgot all the lyrics ...When you see a graphical representation of your words, or I've had two occasions to have people choreograph my songs for ballet, it's staggering to see your words moving." After the group's 20th anniversary album, The Morgans had a long hiatus as the technology of compact discs became dominant. "In a large part, we live in the 19th century, with our music and all. To go from LP to cassette was about as much as I wanted to deal with in a lifetime," Callinan explains. "We do live and exist in the present and love all we can get out of the present, but we hearken back to the other time. That's the feel to our music, and attitudinally you end up being there sometimes." As radio stations switched to CDs, the band got less and less airplay. In 1999, the group put together a compilation CD, "Rolling Home To Old New England." But people kept asking if a new album was coming out. So this past December, "Hove Down ... & Out" was released. The group also took the opportunity to re-release its last three albums "Soundings For The Whale," "Celii On The High Ground," and "20 Years Before The Mast" - on CD. At the same time, the decision was made to discontinue its compilation CD, since all the songs will now be available on original albums. "That one will be passé, or pass b, it might even go down to pass c or d," Callinan quips. "You never know." Even after all these years, The Morgans still have fun recording music. When laying down a tuba track for the "William Tell Overture" on the new album, the group found the recording hysterical. Despite the fact that it has been playing the song in concert, for years, the final recorded version caused the guys to break down laughing. "People just don't expect it," Callinan says. Though the new album is already available, The Morgans will be putting together a more formal launch when the group has a concert in Middletown March 9. While the liner notes indicate that this may be the last album The Morgans record as a group, music is so much a part of the guys' lives that they will continue performing, together and as solo acts, and never be far from a jaunty tune.
" ...The snow was underfoot as we searched up near what passes for a highway for harpoon poles. Your CD was in the mailbox! We are amazed! Wow! What an evening of joy to listen to! I am ordering another 8 CDs for gifts. And a catalogue of other CDs for us! We have no neighbors for a mile. At 2000 ft. elevation I am building our boat to get back to old New England, and points south. Just a crazy seaman in the mountains...Thank you for the talent so dear to the ear. Pete (harpoonguy) "